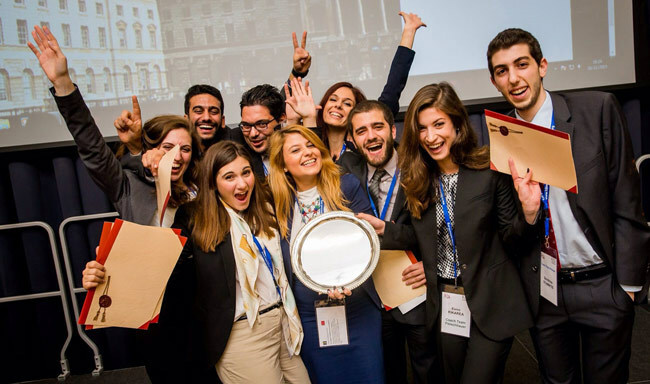 The American College of Greece | ACG Students in the Winning Team of the FDI Moot Court Competition! Home » News & Events » News » ACG Students in the Winning Team of the FDI Moot Court Competition! ACG Students in the Winning Team of the FDI Moot Court Competition! The American College of Greece is proud to announce that five ACG students/alumni were members of the law school team that won first place in the World Tour of the international university competition, ‘Foreign Direct Investment Arbitration Moot 2015.’ The 8-member team represented the National Kapodistrian University of Athens School of Law, and participated in the competition along with 83 teams of undergraduate and graduate students from academic institutions in Europe, USA, and Asia. ACG congratulates the team on their outstanding accomplishment, and is honored to have contributed to the Greek team’s effort. The College, in collaboration with the Attica Tradition Foundation, supported the team by covering the travel and accommodation costs of their participation in the finals, which were held in London, UK on October 29 – November 1. After eight months of hard work and immense preparation, the team competed in the finals with 50 teams that qualified, among which were law school teams from prestigious academic institutions such as Harvard Law School, King's College London, the University of Hong Kong, the University of Ottawa, the Johannes Gutenberg-Universität Mainz, Lomonosov State University of Moscow, and the National Law School of India University. After an intense three-day competition, the team was presented with eight awards and won the coveted first place! The American College of Greece has one more reason to celebrate, as five students participating in the winning team are members of the ACG family: all of them are studying – or have studied – at DEREE, in parallel to their Greek university law studies. 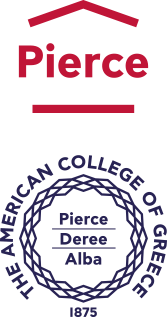 Two of the team members are currently pursuing a minor at DEREE on scholarship by The Stavros Niarchos Foundation and DEREE, and two of them have attended both PIERCE and DEREE! Eleftherios Dafermos and Dimitris Stamatis are DEREE SNF Scholars, pursuing minors in Finance and Economics respectively. Maria Eleni Chrysanthakopoulou, a PIERCE ’12 alumna, is currently pursuing parallel studies at DEREE in International Business; during the preliminary rounds she was awarded Honorable Mention Advocate and Best Advocate in the Final Hearing. The team’s coaches are also members of the ACG community: Kleoniki Maria Sergaki, a PIERCE ’10 alumna, graduated with a Bachelor of Art in Economics (Hons) from DEREE in 2014 while Irene Kikarea is pursuing Finance studies at DEREE. Sergaki and Kikarea were also part of the Moot Court 2014 team, which won third place in last year’s competition. The team also included Thomas Papadogiannis Varouhakis, Nikoletta Chalikopoulou, and Despina Arslanidi, who was presented with the Thomas Wälde Award for Best Advocate and with the Manuela Béltran Woman Advocate Award for the preliminary trials. The Foreign Direct Investment (FDI) Arbitration Moot is an annual competition designed to simulate an investor-state arbitration, such as those carried out under the rules of the International Centre for the Settlement of Investment Disputes (ICSID). The FDI Moot helps future lawyers attain a practical understanding of international law and policy. The case and hearings offer a unique forum for academics and practitioners from around the world to discuss developments and assess emerging talent. This year’s case focused on a damages claim arising out of a change to a guaranteed “renewable energy” feed-in tariff, and raised the issues of the validity of an “Intra-EU” BIT and specific performance. Specifically, the case concerned recourse claims of a foreign investor/producer of photovoltaic solar energy against the country hosting the investment, in London International Arbitration Court. Solving the case required knowledge of international investment law, combined with a deep understanding of finance and economics. Q.: What's the benefit of parallel studies at DEREE? One of the most important benefits is student life at DEREE. It made me realize that college years should not just be about lectures and exams, and that getting involved does matter; it adds value to the chances of networking, and provides valuable knowledge – both academic and personal. Q.: Who would you like to thank for their support during this long journey? Most of all I would like to thank my teammates, as well as my professor and coaches, for all the hard work and the team effort we put into this project. No award can reflect the team spirit that we were able to foster, nor the decisiveness, or any other virtue we earned throughout our effort. We would also like to thank our supporters, since this trip would have been very difficult to make without their generous contribution. Q.: What's the 'recipe for success' in your opinion? What did it take to reach your goal? I believe that the two main elements of our ‘success’ were hard work, and great cooperation. We really did function as a family (which is to be expected after spending so much time together). No one tried to show off, or prove themselves better than the others – we were equal. Each and every one of us had something unique to offer to the team, the combination of which led to our accomplishment. Q.: How did your parallel studies at DEREE help you as a member of the team? My studies at DEREE gave me a head-start as far as economic and business knowledge is concerned, especially since this year’s case involved a lot of economic, business and financial thinking. Our DEREE background allowed us to be creative with policy arguments, and actually deprive our respected opponents of the chance to rebut our arguments. Q.: What's your advice for next year's team? Like the saying goes, "a successful team beats with one heart,” so I would advise them to work hard and work together; question themselves, and their arguments constantly; listen to the professor and their coaches; and try to constantly improve. If they follow this advice, success is the only option. Q.: In what way did your studies at DEREE help you as a member of the team? The FDI Moot Court Competition not only requires a solid law background, but also a deep understanding and thorough knowledge of finance and economics. Last year, our case concerned the haircut of sovereign bonds, whereas this year we had to calculate the damages suffered by a company. Being an Economics student – and now alumna – of DEREE, allowed me to understand certain concepts on a deeper level, and produce more creative arguments, in line with both legal rules, and with principles of economics and finance. In such competitions, most teams get the legal part right; but what makes the difference is approaching an argument from a different perspective based on ideas or logic that nobody has thought of before. My education in Economics at DEREE allowed me to gain an economics and finance-based perspective, which I used in my legal argumentation.